Bar - very large, rather dark double bar room, food not bad, drink fine. Hotel - small double room was perfectly acceptable and (being a Sunday night) very reasonably priced, a bargain even. Quiet, clean and with modern furnishing, plus ensuite shower. Recommended (although I appreciate it may be a different experience over the Regatta weekend). There are some decent Wetherspoons around, this however isn't one of them! First called in a couple of years back, without buying a beer! This time, we got to the bar, all ordinary beers on hand pump, so opted for a bottle of USA Porter, 330 ml at £2.99 not cheap, the barman said it's £3.29, we haven't changed the signage! Sorry mate, see you later! So, still yet to have a beer there! It’s a Wetherspoons Jim, but not as we know it ! An impressively large building that has (probably) not undergone much change since becoming part of the chain. 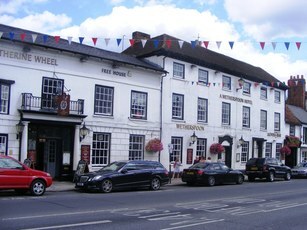 The hotel occupies much of the high street, though the pub itself isn’t nearly so large. Once you’ve found the correct entrance, you pass through a window lined corridor into the heart of the pub. The bar is on the left, and another drinking area is on the right. There are not many clues that this is a Wetherspoons. The range of real ales comprised Greene King IPA and three guests – no Ruddles, Abbot or “trio of doom” ! There were also couple of craft keg beers, and a large glass iced-water dispenser. The menu is of the A5 style – which I believe is common for more upmarket Spoons. Food however, is the standard Wetherfare, and not cheap – the Friday Fish Club being £7.49 for example. Unfortunately, the 3 guests were all very similar – pale / golden ales. I had the Dark Star Hophead – which was reasonable. Finally, I should mention the wooden panelled corridor which leads from the bar to the toilets – not something you find in every Spoons branch. Nowt wrong - stayed here and the rooms good - request 2nd floor to avoid noise Fri/Sat. Ales - nothing to write home about but can't be beaten on price. 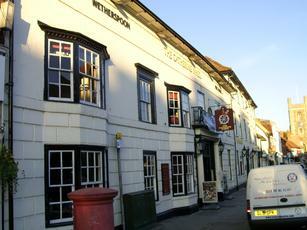 Double-sized Spoons, pleasant outdoor area, all the usual suspects beer and cider-wise, dirt cheap food and drink by Henley standards, what's not to like? Well, my main gripe is the staff who seem to either be trainees on their first day (not a problem, but on a busy Summer weekend?) or are utterly dis-interested in serving anyone. We stayed here, rooms good value and if you've been here before you know to either bring your headphones or embrace the noise by staying in the bar until 1.00AM.